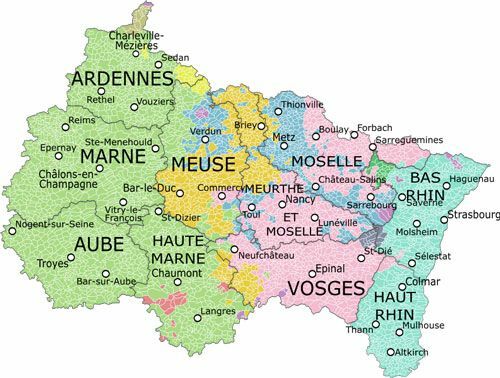 Grand Est is the newly adopted name of the region Alsace-Champagne-Ardenne-Lorraine or ACAL. This region was created with the territorial reform that took effect on January 1, 2016. The Grand Est is the 6th largest French region. Strasbourg is the administrative centre or préfecture. Strasbourg Eurométropole regroups the city of Strasbourg and Greater Strasbourg; it is the region's largest inter-urban area. Strasbourg is also the seat of the Council of Europe, European Parliament and European Court of Human Rights. The Metropole du Grand Nancy or Grand Nancy is the region's third most populated inter-urban area. Strasbourg and Nancy are the Grand Est's only inter-urban areas with the status of 'metropolis'. Mulhouse Alsace Agglomération is the region's second most populated inter-urban area with over 250,000 inhabitants. Finally, Metz Métropole and Reims Metropole are the other two largest inter-urban communities (over 200 000 inhabitants). The Grand Est brings together the historical regions of Alsace, Lorraine and Champagne, and is thus a blend of Latin and Germanic traditions that vary from an area to another. The Grand Est economy relies on industry, agriculture and trade. It is also a major place of international trade exchanges. Firstly, it has common borders with Belgium, Luxembourg, Germany and Switzerland. Secondly, it is centered on the Rhine Valley, the focal point of the European Megalopolis or Manchester–Milan Axis, also known as the Blue Banana. This discontinuous corridor of urbanisation is a major trade axis on the continent, as it gathers some 111 millions inhabitants. Goods transit to and from the ports of the North Sea via the Rhine's major river ports of Strasbourg, Mulhouse, Metz and Nancy. Add to this an extensive network of river ways - Meuse, Moselle, Marne and Saône. Finally the international airport Basel-Mulhouse-Freiburg, contributes to these international exchanges. 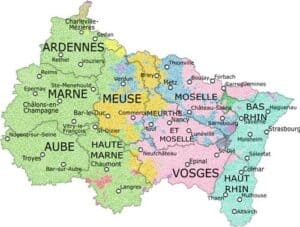 Three other airports serve the Grand Est: Strasbourg-Entzheim, Metz-Nancy-Lorraine and Chalons-Vatry. The Grand Est has 6 nature parks (7 in 2018) that largely contribute to sustain local tourism. The hilly Alsace and Vosges areas have a mountain climate. The Vosges are the only mountain range in the region and boast 25 skiing resorts. Western Champagne has an oceanic climate, however, the eastern side is semi-continental. This area is renowned for its prestigious vineyards, which are amazingly the northernmost in France. The rest of the Grand Est region has a semi-continental climate, with pockets of micro-climates depending on the altitude.